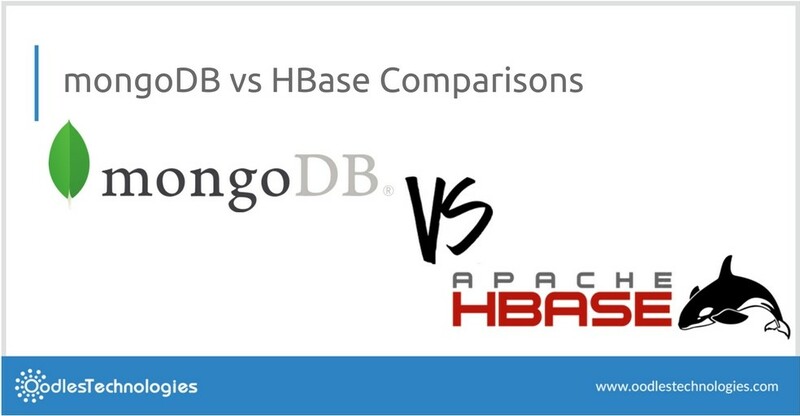 MongoDB vs HBase had always been a point of discussion before taking a final decision by firms in context of which database platform to choose among the two. In most of the organization's, conventional databases serves as an already established technology which usually underpins the today’s existing apps that are capable of meeting the current business needs. Meanwhile, IT teams are always looking for alternatives for the conventional relational infrastructure as they are more into building modern applications which allows for attaining a faster time to market further strengthened by the agile development and more flexible data models. And hence, the two most relevant database apps of present times that are MongoDB and HBase naturally get compared and there is a never-ending discussion while talks prevails over the topic - “MongoDB vs Hbase”. Besides, handling steeply ever widening volumes of structured and unstructured data is not possible via use of the traditional data processing apps. Further, they also need to think about scaling much larger than the capacity limitations of the existing systems and web applications. Besides, the cost involved in the maintenance of the expensive conventional database softwares and hardwares are too high to be paid for. Also, one should look towards comparing mongodb vs hbase vs cassandra before taking a final decision. And now, in order to meet these requirements, firms are developing a whole new segment of non-conventional and highly scalable databases. MongoDB and HBase are the most prominent leading application frameworks of the present times. In order to help IT teams choose the best suitable option according to their business-specific requirements, we are making a comparison in context of “MongoDB vs Hbase”. MongoDB : MongoDB is an open source and free cross-platform document-oriented database architecture. Declared as a NosQL database program, it is developed by MongoDB Inc. MongoDB is a table-based relational database model which uses JSON-like documents that may vary in structure and can lead to making the data integration in a particular type of apps faster and easier. For e.g., in MongoDB, it becomes comparatively easier to store the title and author of a book in a single document called “Book” instead of storing it in two distinct relational structures. Hbase is an open source distributed database based on google’s Bigtable and had been written in Java. Developed as part of Apache Hadoop project, it runs on top of HDFS(hadoop Distributed File System) and thus providing Big Table like functionalities for Hadoop. Hbase has been designed to perform key-value workloads in accordance with random write and read access patterns. Further, HBase is a sparse and distributed multidimensional sorted map and is indexed via a row key, column key and a timestamp. Besides, each single value in the map reflects an array of bytes that have never been interpreted. Although both provide almost the similar features and functionality, but there are still a few minor differences there while doing a comparison on “MongoDB vs HBase”. Documents are similar to the structure of the objects in the programming languages. This aids to the enhanced ease to the developers. The advantage of expressive query language is that it allows running queries that are complex to support an advanced operational as well as real time analytic functions. Inbuilt feature of the database that includes text geospatial, compound, TTL indexes etc. Inbuilt secondary index allows more developer productivity. It also supports more data access patterns to handle complex query. I hope this blog which focussed on the head to head comparison in context of “MongoDB vs HBase” will help you in taking a decision about which one to adopt for your business-specific needs.